While there have been tremendous advances in our scientific understanding of the brain, this work has been largely academic, and often oriented toward clinical publication. Cognitive Neuroscience of Human Systems: Work and Everyday Life addresses the relationship between neurophysiological processes and the performance and experience of humans in everyday life. It samples the vast neuroscience literature to identify those areas of research that speak directly to the performance and experience of humans in everyday settings, highlighting the practical, everyday application of brain science. The book explains the underlying basis for well-established principles from human factors, ergonomics, and industrial engineering and design. It also sheds new light on factors affecting human performance and behavior. This is not an academic treatment of neuroscience, but rather a translation that makes modern brain science accessible and easily applicable to systems design, education and training, and the development of policies and practices. 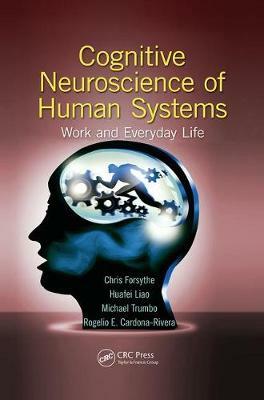 The authors supply clear and direct guidance on the applications of principles from brain science to everyday problems. With discussions of topics from brain science and their relevance to everyday activities, the book focuses on the science, describing the findings and the studies producing these findings. It then decodes how these findings relate to everyday life and how you can integrate them into your work to achieve more effective outcomes based on a fundamental understanding of how the operations of the human brain produce behavior and modulate performance. "I think this book is very important in that it allows the layperson to connect the pieces of the brain puzzle back to him or herself. I think many people conceptually understand that caffeine is a psychoactive substance. The popular media does a good job at advertising how such substances have benefits to our cognitive processes like memory. However, to really grasp that each individual needs the proper dosing at the right time for caffeine to be beneficial is lost. Most people use caffeine to combat sleep deprivation and are not aware of the harm they are doing when they do not consider how caffeine actually affects the brain."